There was no shortage of pets in the Begany household. The Trumansburg, NY, family had cats and, after the loss of their beloved old dog to cancer, they had adopted a young Rottweiler. But Beth Begany was missing an “older, wiser” dog. She began looking on Petfinder for a senior dog, one who stood less chance of finding a forever home. 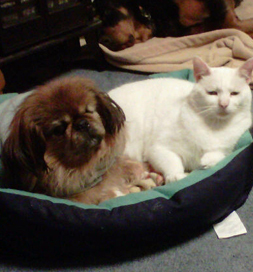 “Then one day I saw her — an older, blind and deaf Pekingese who had been abandoned by her previous owners during Hurricane Sandy,” Beth says. Kimchee settled into the family as if she’d always belonged there. The dog, named Kimchi, was at an open-admission shelter in Bergen County, NJ. Open admission shelters take in all animals that are brought to them and, as a result, are often overcrowded, especially after a natural disaster. Given Kimchi’s special needs, it seemed likely she would be euthanized. Fortunately, shelters go out of their way to find alternatives, and the staff learned that Kimchi had originally been adopted from RBARI (Ramapo Bergen Animal Refuge, Inc.) in Oakland NJ. The no-kill facility took the dog in. They had faith that even an old blind, deaf dog could find a home — and sure enough, Kimchi seemed to be just who Beth was looking for. After doing the necessary adoption procedures, she adopted Kimchi, who settled right into her new home with the other pets. Kimchi’s happy home may seem to her as if it, too, fell from the sky, but in fact, it took a host of caring people to give the old dog her second chance.